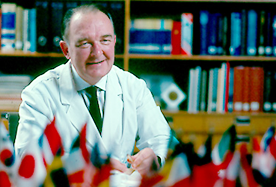 Dr. Paul Janssen (1926-2003) was one of the 20th century's most innovative and inspiring pharmaceutical researchers. With over 100 patents to his name, his work was responsible for many breakthroughs in several fields of disease, including pain management, psychiatry, infectious disease and gastroenterology. Dr. Paul was an exceptionally gifted and passionate scientist who revolutionized modern medicine and inspired a new generation of researchers. 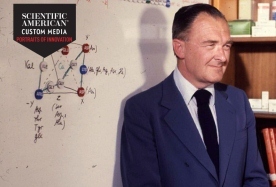 It was Dr. Paul Janssen’s goal to establish a completely independent research company, and in spite of the modest beginning with very limited financial resources and considerable skepticism from outsiders, his belief in his own capabilities and those of his colleagues was unshakeable. 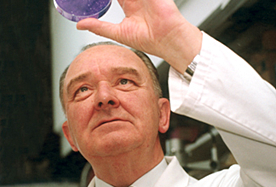 In 1953, he established Janssen Pharmaceutical, N.V., a pharmaceutical research laboratory based in Beerse, Belgium. "People thought my plan was impossible," he said. "I was very young, and part of my motivation was to show them that I was right and they were wrong." And prove them wrong he did. Success came quickly, as the fifth molecule synthesized by Dr. Paul and his associates was found to have therapeutic properties. Many more innovations followed - in fields as diverse as gastroenterology, psychiatry, neurology, mycology and parasitology, anesthesia and allergy. Dr. Paul helped save millions of lives through his contribution to the discovery and development of more than 80 medicines, four of which remain on the World Health Organization’s list of essential medicines. One such medicine, HALDOL® (haloperidol), was the first antipsychotic drug that allowed patients to be treated at home without crippling side effects, and continues to be used for the management of psychosis. Dr. Paul also worked on the development of FENTANYL™, which is still the most widely used anesthetic worldwide, and REASEC™ (diphenoxylate), which is frequently used for the treatment of potentially disabling and fatal diarrhea in developing countries. A plethora of other successful compounds, such as levamisole, miconazole, flunarizine, etomidate, mebendazole, loperamide, cisapride, risperidone and many others, can be credited to his early days. These breakthroughs brought Dr. Paul's company to the attention of the American healthcare company, Johnson & Johnson, and after several months of negotiations, a merger was agreed in October 1961 and completed in February 1962. A key element was the formal guarantee that the Belgian company would retain its own identity and independence within the international group. In the 1970s and 1980s, rapid growth continued. Plans were made to expand the company beyond the national borders. By the end of 1992, Janssen had no less than 34 foreign affiliates and more than 20,000 employees worldwide. In 1992, the company set up U.S. headquarters in Titusville, New Jersey. In 1992, Dr. Paul said, "Every company in the group retains its independence. During the negotiations that led to this co-operation, the future and the protection of our company were uppermost in my mind. For me and my employees, the merger was rather a sort of life insurance contract." And to this day, Janssen Pharmaceutical still very much echoes the history of Paul Janssen. Today, Dr. Paul’s legacy lives on at Janssen Pharmaceutical Companies of Johnson & Johnson, which comprises nearly 40,000 employees around the globe, focused on finding new and better ways to prevent, intercept, treat and cure disease. Throughout his lifetime, Dr. Paul was the recipient of many awards, including five honorary professorships and 22 honorary doctorates. He is also the author or co-author of more than 850 scientific publications and was honorary member of over 30 scientific institutes and organizations.